Edinburgh Castle is a historic fortress which dominates the skyline of the city of Edinburgh, Scotland from its position on the Castle Rock. 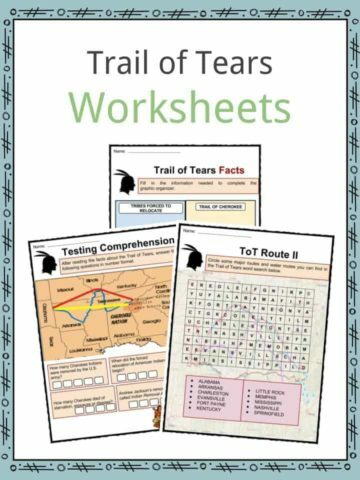 Human settlers have lived here from as far back and the Bronze and Iron Age. 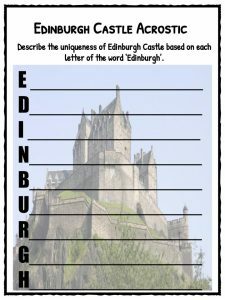 For more fascinating facts and information about Edinburgh Castle, see the fact file below or download the comprehensive worksheet pack which can be utilised within the classroom or home environment. Edinburgh Castle is built on the Castle Rock, which is a large, inactive volcano that is believed to have risen around 350 million years ago. The summit of the castle rock is 130 metres (430 ft) above sea level and has rocky cliffs on the south, west and north, rearing up to 80 metres (260 ft) from the surrounding landscape. 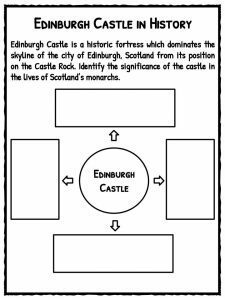 This means the castle can only be reached from the east, where the ridge is less sloped, and the defensive advantage may have played an important part in the decision to build Edinburgh Castle there. Archaeologists are unsure when Castle Rock was first used by humans and there are no records of Roman interest in the site up to the end of the first century AD (100 AD). The first possible mention of Castle Rock may have been in a map, called Ptolemy’s map, in the 2nd century AD. This map shows a settlement called “Alauna” which means “rock place” and could be the earliest know name of Castle Rock. An archaeological dig in 1990 revealed that people on the Bronze Age, or Iron Age that followed were the first people to live there, and built a fort on Castle Rock in 2nd century AD, mid-way through the Iron Age. In the early Middle Ages, Edinburgh Castle is next mentioned in 600 AD in a poem which describes a band of warriors who spent a year feasting in their fortress before fighting to the death in the battle with the Angles at Catreath in Yorkshire. The first mention of a castle in Edinburgh was an account that Queen Margaret (also known as Saint Margaret of Scotland) was living at Edinburgh Castle when she heard that her husband, King Malcolm III, had died in November 1093. The account also says that Queen Margaret herself died a few days later because she was overcome with grief from the loss of her husband and King Malcolm’s brother Donald Bane laid siege to the castle. 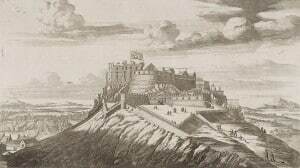 The north-east view of Edinburgh Castle in the 17th century. It was during the reigns of King Malcolm III and his sons that Edinburgh Castle became one of the most significant royal centres in Scotland. Malcolm’s son King Edgar died there in 1107. King David I, Malcolm’s youngest son, reigned from 1124–1153 and spent much of his time at Edinburgh Castle where he developed Edinburgh as a the centre of royal power in Scotland. Edinburgh Castle is thought to have been built using timber, although two stone buildings were documented as early as the 12th century. One of these building, St. Margaret’s Chapel, remains at the summit of the rock to this day. 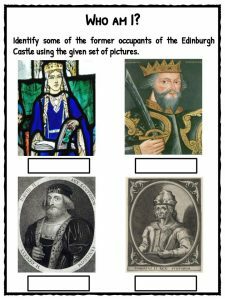 During the Wars of Scottish Independence, starting in 1296, King Edward I of England launched an invasion of Scotland and Edinburgh Castle came under English control. Edward I of England died in 1307 and on March 4th, 1314, a surprise night attack by Thomas Randolph, 1st Earl of Moray recaptured the castle for Scotland and the King of Scots, Robert the Bruce, ordered Edinburgh Castle defences be destroyed to prevent the English re-occupying it. Ownership of Edinburgh Castle changed between England and Scotland throughout the Wars of Scottish Independence in the 13th and 14 centuries. In the 14th century King David II began to rebuild Edinburgh Castle and David’s Tower was started in 1367. When David II died in 1371, King Robert II completed the tower in the 1370s. During the 15th century, the castle was used increasingly as an arsenal and armaments factory. This means Edinburgh Castle was used to store and make ammunition and guns. The first gun was purchased for the castle in 1384 and the “great bombard” Mons Meg was delivered to Edinburgh in 1457. A bombard is a type of large cannon which fires cannon balls. Mons Meg was 6 feet 6 inches long and fired 20 inch cannon balls. 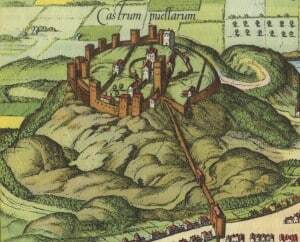 A late-16th-century depiction of the castle, showing David’s Tower at the centre. In the 18th century and early 19th century the castle vaults of Edinburgh Castle were used as a prison for many conflicts. 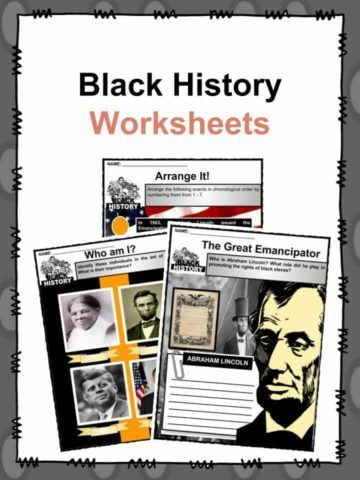 These include the Seven Years’ War (1756–1763), the American War of Independence (1775–1783) and the Napoleonic Wars (1803–1815). It was also during this time that several new buildings were built inside the castle. This included stores, powder magazines, the Governor’s House (1742), and the New Barracks (1796–1799). The use of Edinburgh Castle came after a large prison break in 1811, after 49 prisoners of war escaped via a hole in the south wall. However, the castle was used once more as a prison during World War I and World War II. Edinburgh Castle is now under the care of Historic Scotland, part of the government, and is Scotland’s most-visited paid tourist attraction, with over 1.4 million visitors every year. In fact, over 70% of all visitors to Edinburgh also visit the castle. 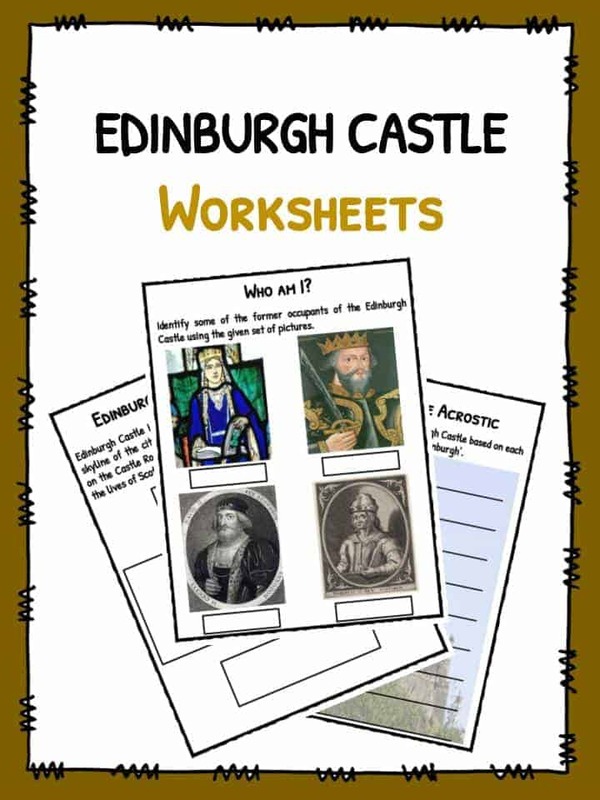 This bundle contains 11 ready-to-use Edinburgh Castle worksheets that are perfect for students who want to learn more about Edinburgh Castle which is a historic fortress which dominates the skyline of the city of Edinburgh, Scotland from its position on the Castle Rock. Human settlers have lived here from as far back and the Bronze and Iron Age.